Fishbeam releases the final version of Goldfish 4.5.2 for download today. The update to Goldfish 4.5.2 contains many improvements like embedded fonts and is free for all users of Goldfish 4. Windows: Fixed several bugs with connections to the Fishbeam server (update, registration, Fishbeam Cloud, sending error logs). YouTube videos on Windows: Fixed display errors when loading the preview image into the editor. Editor under Windows: Display errors eliminated. Windows: The Fishbeam clips load again in the 64-bit app in all cases correctly. Drag & Drop under Windows improved. Windows: Fixed several bugs that could lead to a crash. PS: The update will soon appear in the Mac App Store. Published in Goldfish4, Webdesign, Publish on 21/02/2019 12:01 am. With the new Goldfish 4.5.2 you can integrate fonts from Google Fonts, as well as all other fonts for the first time fully legally compliant with the EU General Data Protection Regulation (GDPR). The Google Fonts service provides free fonts for websites that are not installed on the user's device. If you want to use fonts other than standard fonts (Arial, Helvetica, etc.) on your website, this service is essential. Since the fonts are delivered directly from Google, the IP address of the user is transferred to Google. According to the European General Data Protection Regulation (GDPR) this may not be allowed. A basic judgment is still pending. In Goldfish Version 4.5.2 or higher, click on "PROJECT" in the upper left to view the project properties. At "Embedded Fonts", click on "Select ...". 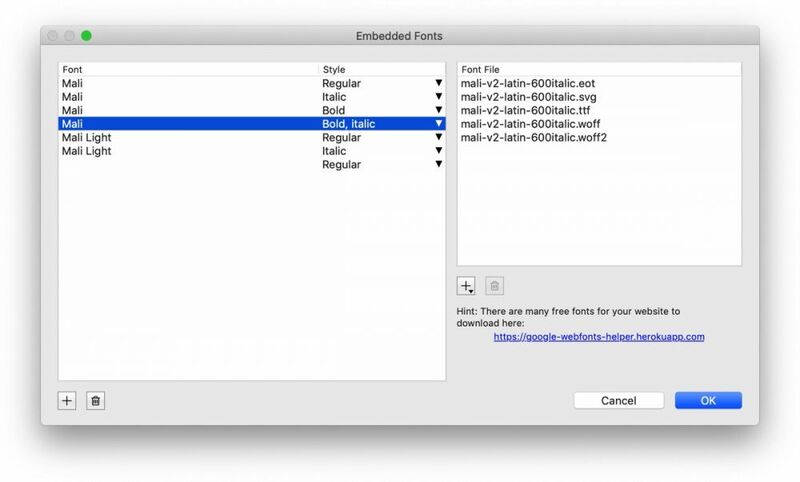 Go to the "google-webfonts-helper" page via the link displayed in Goldfish. Find the font you want to embed, e.g. "Mali". Enable the desired font variants, e.g. 200, 200italic, regular, italic, 600 and 600italic. Make sure that "Best Support" is active and click on "Download files". Click "+" on the bottom left and create an entry with the appropriate style for each font variant. For example "Mali" (style "Regular"), "Mali" (style "Italic"), "Mali" (style "Bold") and "Mali" (style "Bold, italic"). There is no corresponding font style in Goldfish for the font variants "200" and "200italic". Because of this, create "Mali Light" (style "Regular") and "Mali Light" (style "Italic"). Click "+" below the empty list on the right and select "Add individual files ..."
Go to the folder with the font files and select all associated files (multiple selection with cmd + click or shift + click). Published in Goldfish4, Webdesign, Publish Privacy GDPR on 20/02/2019 11:42 pm. Fishbeam releases the final version of Goldfish 4.5.1 for download today. The update to Goldfish 4.5.1 contains urgent bug fixes and is free for all users of Goldfish 4. The blog accepts \ and ' characters in the user interface text properties. The background color of the drawer from the drawer menu can now be switched off and the transparency can be changed. Animations keep their name when copy and paste, if the name does not already exist on the page. Improvements in the graphical representation in the project window. Animation: "Open Link" works again in all cases. Link to item: It will now be gently scrolled in all cases instead jumped. The release notes now show the quotation marks „ and “. Create Website: Fixed a bug where the wrong warning "Components from Goldfish Professional included" appeared. Published in Goldfish4, Webdesign, Publish on 21/12/2018 09:30 am. 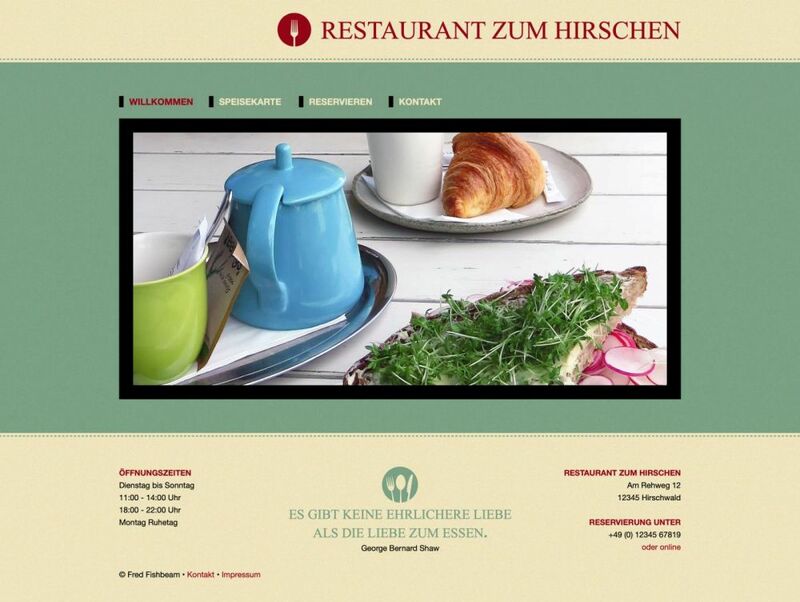 Fishbeam Software publishes the new website design "Zum Hirschen", that is available for free on our Designs page for download. Published in Goldfish4, Webdesign, Publish on 22/11/2018 02:48 pm.